The latest upgraded 5 axis breakout board is specially designed for the CNC single axis 2-phase stepper driver controller. The breakout board using high-performance three-state bus driver 74HC244 and Schmitt inverter 74HC14. amplified, The input signal is amplified, rectified, filtered to make the drive capability of the output signal more stable and stronger. With this 5 axis breakout board, any 1-5 Microstepper driver controllers can be directly controlled by the PC via the MACH3, EMC2, KCAM4, etc. parallel-control CNC software. 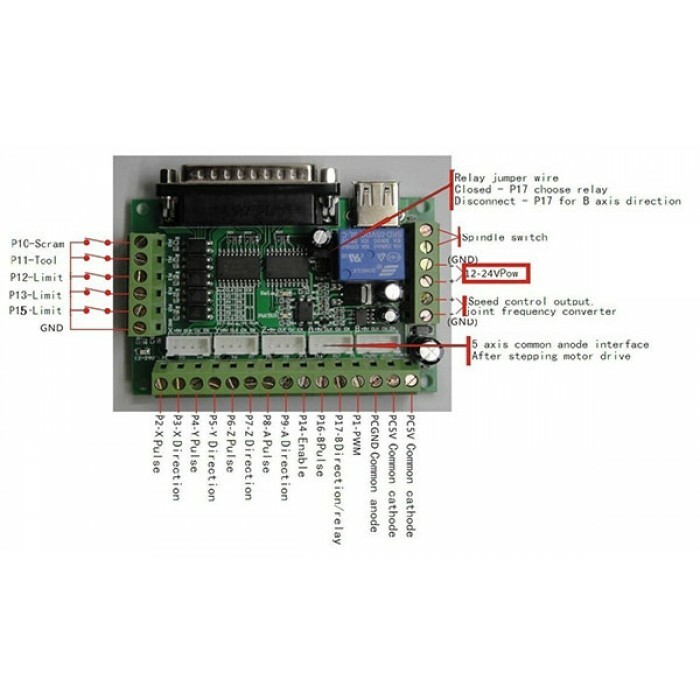 Maximum support 5-axis stepper motor driver controllers. USB power supply and peripherals powered phase are separated to protect computer security. Compatible with all the 2 phase microstep drivers in the market. Output 0-10V analog voltage for inverter to control the spindle speed. Shape Pulse and direction signals. Data transfer speeds of up to 10MBit/S. Amplification, filtering, enhancement processing drivers enable signal. Suitable for a wide range of 2-phase microstep drivers in the market, such as M542, M542H, MA860H, 2MA2278, 2M542, 2M860 etc. For advising, such as brand, architechture mould, badge, nameplate, display boards, doorplate, furniture decoration, etc.It can be used in various kinds of machines, such as X-Y tables, labeling machines, laser cutters, engraving machines, pick-place devices, and so on. This breakout board is just a interface board, NOT a stepper driver board, it must work together with the microstep drivers(eg. MA860H etc..) to control the stepper motors. So, it CANNOT control the stepper motors solely.